The ZOOM 2 is one of the most economical and precise fiber optic power meters in the world - delivering professional performance and a complete feature set for optical loss testing in both multimode and singlemode networks. The ZOOM 2 can store reference values for all of its calibrated wavelengths, and displays optical power as an absolute value in dBm or relative to a user set "zero" reference in dB. It has an intuitive two-button interface, with one button controlling power and wavelength selection, while the other is used to toggle between dBm, dB, and uW, as well as setting the optical reference, or "zero". Other standard features include a 4-digit, 0.01 dB resolution display, battery status indicator, and a 2.5 mm Universal detector port that is compatible with FC, ST, SC, DIN, and any other 2.5 mm ferrule connectors! The following accessories are included with each ZOOM 2: rugged rubber boot, carrying strap, NIST certificate of calibration, and operations manual on CD. 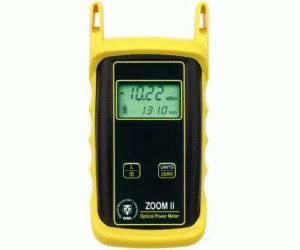 The ZOOM 2 can also be upgraded to include data storage and a download port to turn it into a full-featured fiber optic link certification power meter.